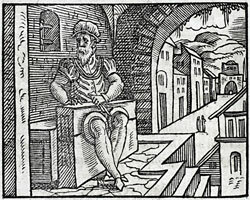 Alciato at Glasgow: Emblem: In aulicos. Von Hofschrantzen. The court, so full of vanities, supports the palace entourage, but binds them with fetters of gold, it is said. Und mit gülden fesseln verwickt.